Penn State researchers have developed a cleaner, more economical, and more water-efficient method of separating the bitumen component from oil sands. Paul Painter, professor of polymer science in the Department of Materials Science and Engineering at Penn State, and his group have spent the past 18 months developing a technique that uses ionic liquids (salt in a liquid state) to facilitate separation. The separation takes place at room temperature without the generation of waste process water. 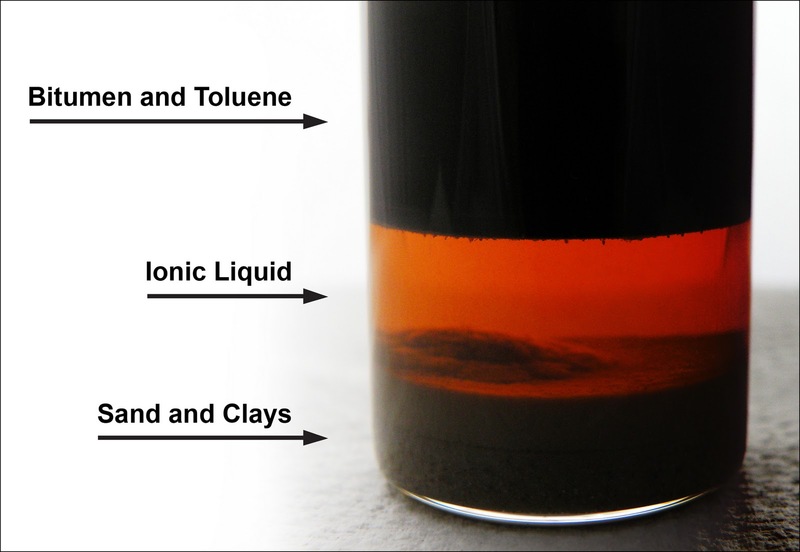 “Essentially, all of the bitumen is recovered in a very clean form, without any contamination from the ionic liquids,” Painter explained. Because the bitumen, solvents and sand/clay mixture separate into three distinct phases, each can be removed separately and the solvent can be reused. Cleaner and more efficient methods for producing oil from abundant oil sands should make a lot of people happier and less frantic about the future of global energy supplies. Unfortunately, for too many "doomers", the only joy they get in life is from contemplating the total breakdown of global civilisation. For such as those, good news is bad news. For the rest of us, we will do the best we can and move on from there.